Schnitzel is one of those quintessential dishes that the Germans actually make and eat on a regular basis (unlike Chinese Chop Suey – I’m not even too sure what that is…). The Mensa at our university serves schnitzel at least once a week, normally with some kind of sauce, but it can also be eaten as is, hot and freshly fried from the pan and perhaps garnished with a slice of lemon. The following recipe comes from Florian, my boyfriend. 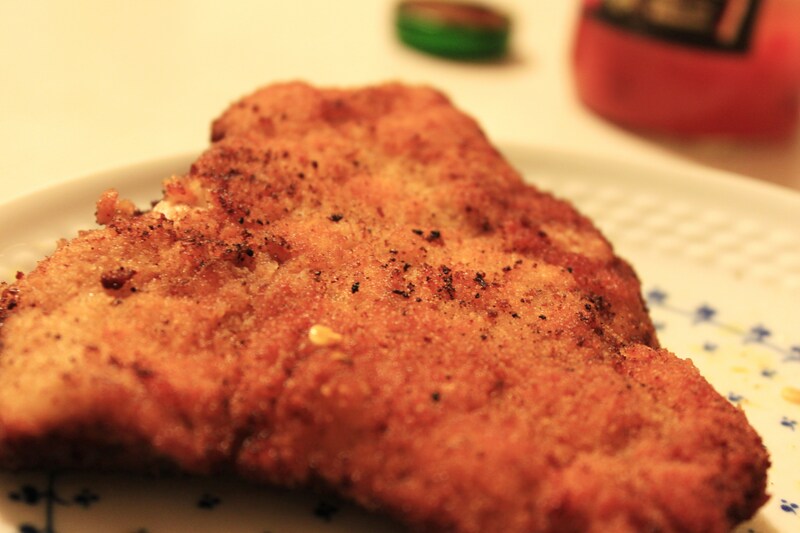 Schnitzel, like most meat products here, is usually made of pork, but chicken and turkey are also frequently used. For an authentic Wiener Schnitzel, veal should be used. He normally uses prehammered schnitzel (you can buy it like any other cut of meat from the supermarket here in Germany) and breads and fries it himself. However, on the day we went shopping, they were sold out of schnitzel, so he substituted with turkey breast instead, and absolutely hammered it into the ground flattened it with the back of a frying pan on a cutting board on the floor. Flatten meat using a hammer/frying pan if not already flat. Put flour, egg, and bread crumbs into three separate plates. Mix a pinch of both pepper and salt into egg. 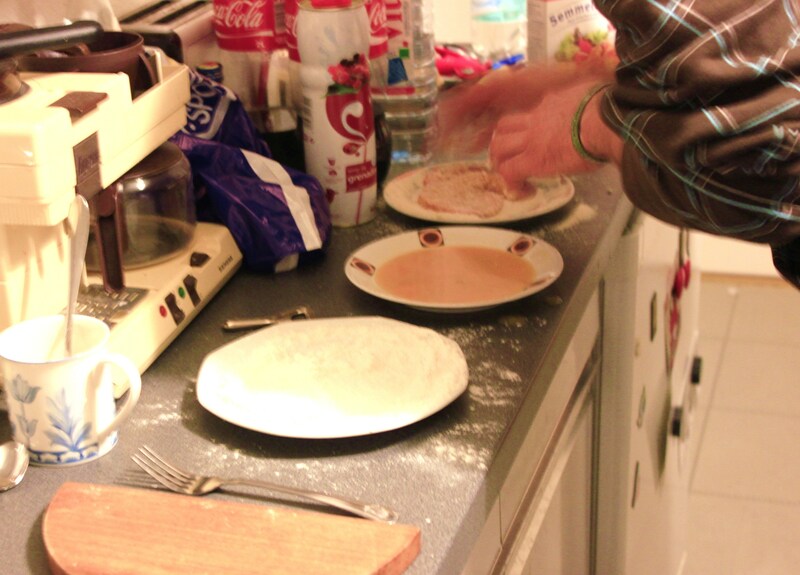 Using one hand, coat the schnitzel evenly with a thin layer of flour. Using the same hand, transfer the schnitzel to the egg and coat evenly on both sides. 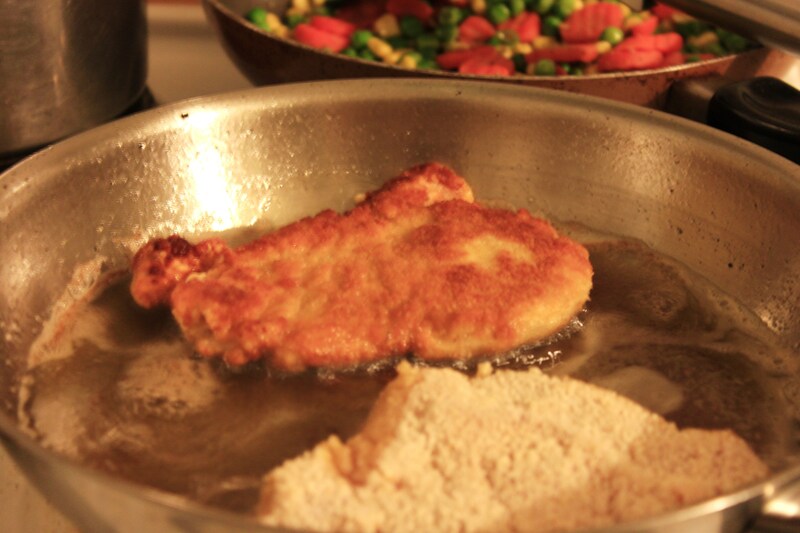 Transfer the egg-coated schnitzel to the bread crumbs and turn it with the other hand. Pat the bread crumbs lightly into the schnitzel to coat evenly. Place coated schnitzel on a plate for later frying. In a pan, heat canola oil (or any equally neutral frying oil) until a small ball of bread crumbs sizzles. Add the schnitzel and fry approximately 3-4 minutes on each side, or until the coating is golden brown. Drain the schnitzel on a paper towel shortly. Serve hot with a slice of lemon. Thanks to Flo for making this (all I did was eat and take the photos, which really don’t do the schnitzel justice…it was very crispy and delicious)! it was actually really quick! and you don’t need any special “schnitzel cut” or anything, just a hammer (or, like Florian, a frying pan). and it’s SO GOOD when it’s hot out of the pan (like many freshly deep-fried things…XD). Does it have to be a frying pan or will any blunt object do?